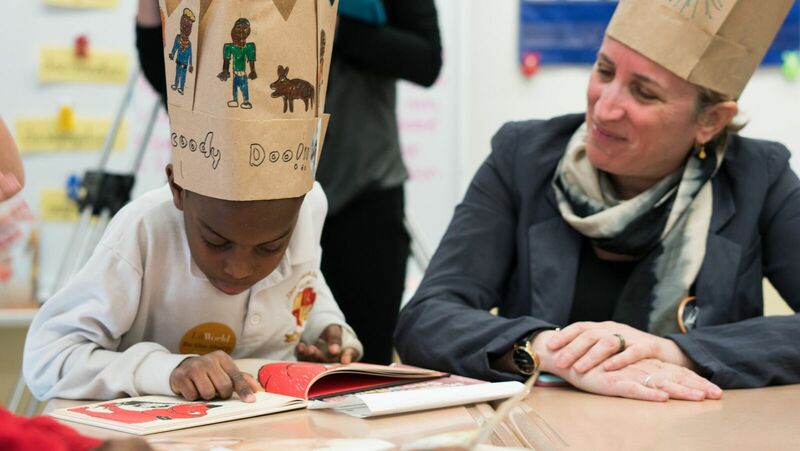 Celebrating World Read Aloud Day in 2017 with students in Brooklyn, New York. The biggest complaint I hear about modern life is noise. We take phone calls in the middle of a gripping podcast, dictate texts to our iPhones while chopping vegetables, and play with our children while observing the cacophony of news stories unfolding on television. The moments that make the stories of our lives so rich get chopped into sound bites. Our own stories, like the ones on our online feeds, are reduced to sound bites. We become so enraptured by the stories of our technology that we neglect our own. Tuning in to the precious moments of our lives and finding the joy—and the stories—that live in every moment, is becoming more challenging by the day. But we’re in luck: there’s one single best practice that, once incorporated into our daily lives, has the power to silence harmful noise, cultivate our ability to listen, and make our families healthier and happier. I’m talking, of course, about reading aloud. It’s easy to discount the power of reading aloud. Many associate it with children learning to read —a stepping stone on the path to silent reading. Or perhaps a flashback to images of deadly read alouds: Little Women’s Jo March, bored, and reading hour after hour to her snoozing Aunt. But, when we take a closer look, we see the profound power of reading aloud to one another: noise that works to free our minds and connect us deeply with one another. Reading aloud, to ourselves and to loved ones, begs our minds and bodies – our ears, our lips, our breath – to become united in both speaking and listening. The text, the reader, and the listener enter into an almost meditative rhythm together. The read aloud space can become safe and familiar: children are first lured in by the voice of a parent, teacher, or friend—a welcome invitation—and then soothed, or inspired. The experience of the story is shared. Unlike the fast-paced, action-packed television, movies and video games which aggressively demand our attention, the read aloud always progresses at the pace of those involved. Listeners and readers may stop to ask questions, make predictions, hold brief but insightful conversations, point out a detail in an illustration and admire the art. None of this happens alone; all of this happens together. Even the loudest of read alouds, hosted by the silliest, most exuberant member of the family (taking on the voices of different characters and creating sound effects) have a softness to them. Like a team of campers seated around a bonfire, the warm crackles and embers of the flame before them, a sleepy contentedness settles over the eyes of those grasped by the read aloud. It’s a magical, ancient thing: telling stories to each other is something human beings have done together for thousands of years. February 1st is World Read Aloud Day. I invite you to silence the noise and tune into the sound of Story. Tens of thousands of children, and people in over 100 countries, will come together on February 1st and celebrate the transcendent joy of reading aloud. Make World Read Aloud Day the beginning of a lifelong practice of reading, of listening, of story. Gather your friends, families, and communities, and connect in a simple yet powerful moment of shared experience. Make the choice to tune out the regular chaos of daily life, and tune in to the voices and stories you treasure most. Pam Allyn is a world-renowned literacy expert, author and motivational speaker. She is the Founder of LitWorld, a groundbreaking global literacy movement serving children across the United States and in more than 28 countries, and LitLife, a cutting-edge education consulting group specializing in professional development for PreK-12 literacy instruction.